Before the first lines of the new Volvo VNR were sketched in the design studio, important work had already started—at truck stops. Volvo designers took to the road to ask drivers what kinds of seats they preferred, what they have on their dash, where they put their coolers, what they liked and what they didn’t. 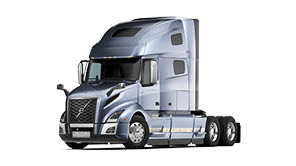 All that truck stop research found its way into the new Volvo VNR driving experience. It turned up in big new things — like the Position Perfect™ three-motion steering wheel, new seats with more adjustments to fit more drivers’ shapes and preferences, and a five-inch, color driver information display. But the research also found its way into countless little details meant to make drivers’ lives easier. A bezel to rest the other four fingers while you scroll on the Infotainment Center. Automotive-style window controls let drivers roll windows all the way down with just one touch. A dedicated space for mobile devices. Every innovation in the new Volvo VNR’s interior has been filtered through drivers’ eyes. 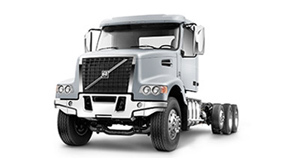 Designed on the road Showing off the new regional haul truck at Volvo’s highly secure design studio in Greensboro, NC, Brian Balicki said that when the team designed the Volvo VNR driver’s environment they didn’t just imagine what might work well. Balicki, who has a commercial drivers license, road-tested their ideas. "It helps understand what breaks down and what’s frustrating to reach for when you’re traveling at speed and trying to manage your driving environment," Balicki says. Removing anxiety Balicki and his team designed the dashboard in zones that can be modified for different applications. They wanted a sense of function to shape the dashboard and instrument cluster. Rock-climbing proved inspirational. "On the rocks", he says, "you want to be able to know where your next handhold is and how you’re using the space. We wanted this instrument panel to be intuitive in the same way, with functions right where they have to be. 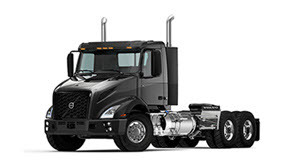 This truck will remove a lot of anxiety for a driver." "When people look at the details in this truck I want them to say, "Why didn’t somebody think of this earlier?"" Balicki says. Revolution in steering wheels Balicki can recite a long list of innovative details—starting with the new Position Perfect™ steering wheel, the only one of its kind in the industry. Not only will the new steering column tilt and telescope, the wheel tilts in relation to the column, which lets drivers position the wheel more vertically, like a car. 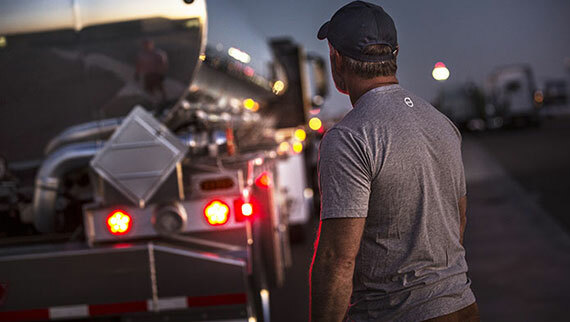 "Lowering your arm cuts fatigue, making it easier and safer to drive," Balicki says. Also, more key functions are clustered on the wheel, putting more control at the driver’s fingertips. 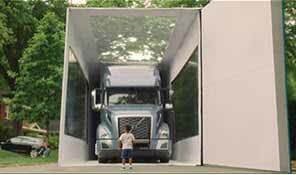 Convenience matters To create so many conveniences, designers had to rethink everything they knew about driving trucks, according to Balicki. "It’s really hard to get a 53-foot trailer parked at a 7-Eleven when you’re thirsty," Balicki says. "A lot of drivers bring their own coolers. We thought, why not tuck a refrigerator under the passenger seat for drinks and sandwiches, with an easy side access? That just makes life a little easier for that driver." Happier drivers are more productive drivers, Balicki says – but it goes further than that. 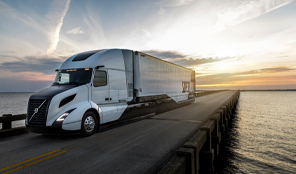 Getting good drivers "If you give owners the opportunity to make a driver a lot happier in the equipment he’s running, he’s going to treat that equipment with a lot more respect," Balicki says. "Drivers are irreplaceable. We have to do all we can to promote the next generation of drivers. 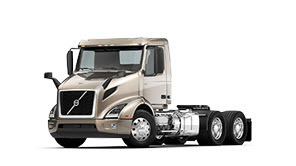 With the new Volvo VNR, we want to make driving as attractive as possible, so our customers can get the best drivers." New seven-inch full color infotainment display offers high-end audio with WiFi, Bluetooth, navigation, apps and exterior camera. The display has both touch-screen and physical controller. And the driver information provides clear icons and easy to understand text. "This system is unique to Volvo. It's a big change for the industry," says Balicki. Only Volvo offers the new three-motion adjustable steering wheel—Position Perfect™. Not only can drivers tilt and telescope the steering wheel, they can tilt the wheel relative to the steering column. "When you position the wheel more vertically, like a car's, you reduce fatigue on drivers' arms, neck and shoulders” says Jason Spence. Seat travel has been expanded fore and aft and has extended the hip-point height for a more comfortable driving posture. New ranges accommodate a wide variety of driver shapes. New controls mean quicker, easier adjustment. Recline has improved, as well. 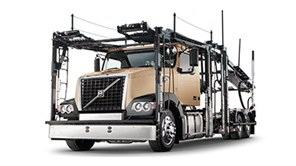 “For driver environment and ergonomics, it’s absolutely the best,” Balicki says. “I swear sometimes the truck market buys cup holders and the truck comes along as an extra,” Balicki says. New cup holders are modular and flexible, mounted on a rail with easy toggle switch release. Drivers can place their beverages wherever they feel most comfortable and feel more at home.